Overall comment: Great place to chill, enjoy the company of friends & family (even me time!) over affordable & delicious food & coffee. Their waffles are recommended! Note: Just show your Student ID and you will be entitled to a 10% discount on any food, beverage & desserts. Comic fans will certainly find this name "Bmon" no stranger & yes, this new cafe is a joint venture of both brothers, Roy & Travis, where Roy is the artist of the Bmon comic! Located at The Strand in Kota Damansara, Bmon Cafe aims to serve its customers good coffee plus delicious food at affordable prices at their comic-themed cafe. The entire cafe is filled with drawings of Bmon from the stairs all the way up to the cafe itself. Comic fans will enjoy this place! 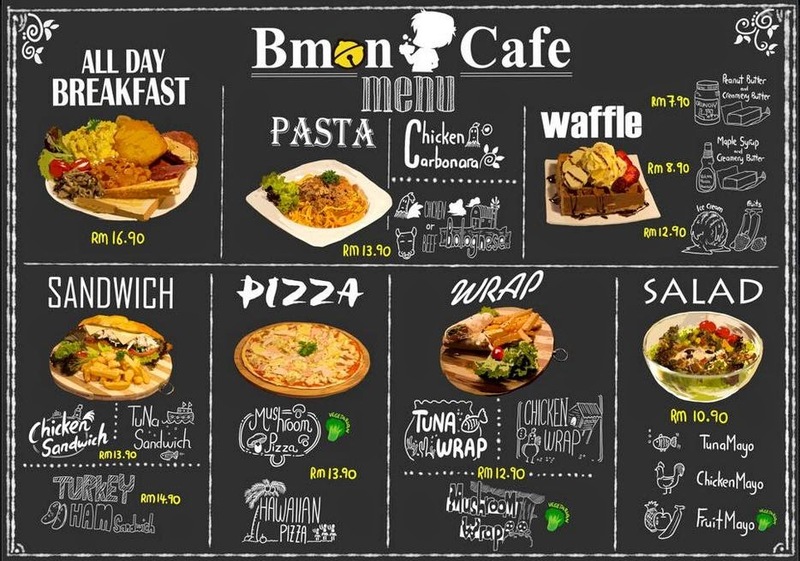 Here at Bmon Cafe, you'll find a good variety of drinks, main dishes & even desserts. Aromatic coffee topped with whipped cream, shaved dark chocolate & a sprig of mint leaves. Very creative, no doubt. It makes the coffee bitter sweet & very refreshing at the same time. I haven't come across many cafes that serve good green tea latte. I must say that the green tea latte here is commendable! You won't find diluted green tea with milk but Bmon Cafe's green tea latte is rich, creamy & they certainly didn't stinge on the green tea. This is best for hot days; fizzy, refreshing & fresh! Apart from the variety of interestingly presented drinks, Bmon Cafe is proud to pair your favorite drink with some of their freshly cooked/prepared dishes. Every dish is reasonably priced, prepared using the freshest & best quality of ingredients for a tasty & satisfying meal. This is the star! Calling all potato fans out there! This is like a potato salad with a tangy cheese sauce! Woohoo! It may be very fattening, but it's SOOOO comforting that even those who count their calories must try this & skip your other meals :P Carbs, veggie, meat - all in one! The other favorite is the waffle! Fragrant, fluffy & wallet-friendly waffles are hard to come by & you can find it at Bmon Cafe! What's not to love about waffles that are done in perfection?? Warm waffles with a scoop of cold ice-cream, anyone? Bmon Cafe's All Day Breakfast serves a simple variety of favorites. I love their mushrooms, but I felt that their scrambled eggs & beef bacon could be further improved. Fresh garden salad with a touch of sweetness from the raisins, fruits & cherry tomatoes plus some crunch from the croutons. I found this simple yet refreshing. This salad is very similar to the one above except that it's a more savory option. I think there's space for improvement of the salad dressing since they call it a caesar salad. The dressing seems to lack garlic, I think. They didn't do very well with their pasta during the time we had our tasting session, but we've provided the team our feedback on the texture of the pasta. Taste-wise, it's not too bad, especially the chicken mushroom carbonara, but the spaghetti were over-cooked, so it was too soft. Check out the generous serving of sandwich filling! *drools* I'm hungry again... and I just had lunch! Thin crust pizza that's great for a single person's main course or as a side dish for sharing. I love the generous serving of mushrooms! If you're around the area or just looking out for a good doze of waffles/comfort food like the Hippo In the Pond, come over to Bmon Cafe for your fix!